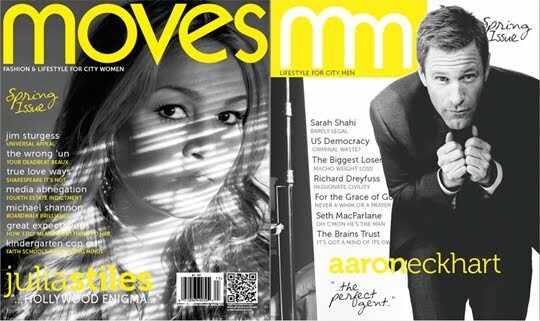 On Thursday, March 10th, Aaron Eckhart hosted the Moves Magazine Spring Cover Party at Plein Sud, The Smyth Hotel. Aaron was extremely charming and a delight to interview. Such a nice guy, he was being whisked away to the airport and didn't forget that I wanted to interview him. Last weekend I saw Battle: Los Angeles, which is highly recommend if you love action movies. I thought it was a combination of Resident Evil: Apocalypse, Terminator Salvation and Black Hawk Down. Aaron has always been one of my favorite actors and his performance was great in Battle: Los Angeles. I would love to see him in more action films. The launch party also featured Moves Magazine's fourth annual Personal Chef competitors, including winners Darlene Rodriguez and Dale Talde. News anchors were paired with chefs, as the three teams battled it out with three main ingredients, three courses prepared in thirty minutes and three judges. The competition was held at The James Beard House in the West Village. Ann Taylor Spring 2011 is Here! Spa Week is Back! Book Your $50 Treatments! Derek Fabulous "It Gets Better Lounge"